Every parent has the opportunity to teach their child the foundations of one of life’s most valuable skills. The skill of effective communication and public speaking. Public speaking happens every time we communicate in public, not just on the rare occasions we find ourselves standing behind a microphone. With this understanding, we gain a real appreciation of the possibilities that may arise for those that are comfortable and effective public speakers and communicators. No matter what life path a child chooses, their ability to communicate well will help them stand out & achieve more (click to tweet). And as with many things in life, learning starts at home. So we thought it would be valuable to ask leading parent writers and bloggers, from their experience, what’s one effective way a parent could encourage or model good communication skills for their child from home? Some points may re-enforce things you are already doing at home, whilst other may serve as nice reminders about simple things you can do with your children now to help them in their later life. A special thank you to all the writers & bloggers who contributed. We encourage you to explore their websites as there are some great reads and excellent resources within these sites. The points are in no particular order, so be sure to read to the end, so that you don’t miss out on some of the best ones! I feel like when we put down our devices (digital or even just a plain old paperback book) and make eye contact with our children as they tell us things, we are showing them that their words are respected and important. I want to teach my children to have respect for those who are trying to express their stories by giving my children my full focus when they are trying to share their own. If I can show my own children the power of listening, they will learn the power of communication. I often get my children to make videos, recording themselves introducing a favourite part of the house or something they love to do. It’s all about YouTube and videos with my two at the moment so this is a great way to encourage them. My son is four-and-a-half, and his communication skills are actually pretty good– if “pretty good” is an acceptable way to refer to someone who occasionally screams for thirteen consecutive minutes because he doesn’t like tacos (he DOES like tacos). The kid has no problem speaking his mind, clearly and effectively, and we encourage it, and try to teach by example: we don’t talk down to him (I hate baby talk), and I only *occasionally* scream about tacos. Still, he’s four, so he doesn’t always know what I mean when I suggest that he curb his enthusiasm for whatever the polar bear on “Octonauts” just did and try to restrain himself from wildly gesticulating when there is a plethora of half-full beverage receptacles in such close proximity to his flailing extremities, but I think it’s helped him pick up some new words. Plus, when I hit the thesaurus hard like that, his initial confusion at the bizarre words I’m spewing usually causes him to stop in the middle of his constant ruckus-making and consider what the heck Daddy just said, thereby buying me a few minutes of silence AND improving his comprehension and vocabulary. And my sanity. Win-win! To encourage good communication in our children, I believe that one of the greatest gifts a parent can give their child is to listen to them. To really listen. During the busyness of our lives, it’s all too easy to ask your children a question in passing but not truly listen to their answer. If this happens often enough it can have the effect of making young children believe that their communication doesn’t really matter, so they may as well say nothing. They can become passive ‘listeners’ not really engaging in everyday dialogue. So it’s important to set time aside each day to have a chat. Try and craft your questions to elicit as much information as you can. Not only will the answers be fascinating; you are also helping them develop and broaden their vocabulary. I believe one of the best ways of encouraging effective communication in children is to make the questions interesting and open-ended. With very young children, ask them lots of questions about the world around them that can’t easily be answered with a yes or no. During their tween and teen years, children can become monosyllabic so I’ve found this strategy really useful. Although (and this is VERY common), at the moment, my teenage son communicates in a series of grunts and snorts… It’s a battle to have him chat like he used to, but I persevere, knowing that his communication skills will return in force once puberty passes. There are some words I feel children should automatically include in everyday language all the time. They are the obvious ones… Please and Thank You. Apart from it being polite to do so, it encourages them to think about being grateful for what they have. If you are finding it tricky to elicit these words, think about setting up a simple reward chart. Once the children get to a certain number of “Ts and Ps” you can thank them yourself by applauding their efforts and giving them a little treat. Swearing for effect can be common in young children. They may well have no clue what the word actually means, rather they delight in the reaction saying it has. I have taken the approach that it is more important to teach children when to swear rather than try and knock it out of them completely. In so doing, the swear words lose any fascination they may have held. In social settings, I’ve always encouraged my children to shake hands (I don’t think it’s fair to ask them to kiss a stranger), say hello and look the recipient in the eye whilst doing so. I started asking them to do this from about the age of two. It’s important and builds their confidence and instils important positive social skills. Above all, I guess I would encourage parents and carers to talk to their children all the time. To fill their everyday with chatter and discovery. Each day, add in new words and challenge them to think of their own new, fun words to use. Try and make the learning of new words and how to communicate a fun, exciting daily family ritual. Generally when children are asked about their day mum would ask “How was your Day?” and the child would typically answer “good”, that’s it no more. The key to getting a longer answer is asking the question differently. What was your favourite part about school today? Why? Here is more details about conversation starters for kids. I have spoken to my children as adults since birth really, trying not to abbreviate words or speak in ‘baby language’ which has really helped with their speech development, both speaking at an early age with wide vocabularies. I think it helps that my Mum was a teacher and I also lecture, so we’ve helped to support their learning from a young age. I think exposing children from birth to books and reading is crucial too, it starts them off on a journey of discovery, and finding joy in reading and using their imagination from day 1. From a young age we have encouraged our children to speak with confidence. To lift their head, speak loud and clearly so other can understand them. If they are nervous the assurance they show through good communication assists them in these circumstances. If they appear confident others will be confident in them. For example. When they started a new school and met a new child instead of sitting to the side and waiting for someone to show them around; they went and introduced themselves with a clear voice and made a connection. While I understand every child is different and not all of them will have the confidence to do this straight away; start with a family friend that you haven’t seen for a while and go from there. With my children, I have always tried to use an adult vocabulary. When you speak down to their level, you do not encourage their growth. At four years old, my daughter had an unusually large vocabulary for her age and a mother on the playground suggested I have her tested for the metro gifted program! My daughter always asked me what words meant and I encouraged her to do so explaining to her the only way to learn is to feel free to ask questions. My daughter naturally made use of new words she learned. Sometimes she tried words out inappropriately but I took advantage of those times to congratulate her on using new words and to let her know a more accurate definition and a way of using it for the next time. I think spoken communication will vary from child to child, depending on many factors. I think the strongest way we can encourage them is by modelling good spoken communication ourselves. I remember my mother greeting people that she passed in the street with a “good morning, sir” or ‘How are you today, madam?”, or she’d make small talk and I wondered why she would speak to someone whom she did not know. Will this make him a better communicator in the long run? I have no idea, but I still remember my mum communicating and having moments, so perhaps I’m sowing a little seed. That’s my standard response…particularly when they are going through the Why phase! I always encourage my children to share their news by calling up their grandparents and putting them on the phone for a few minutes. They have found this increasingly easier over time. This helps them communicate more clearly. I go through the conversation with them first e.g Why don’t we call gran. You could tell her you got 9 out of 10 in your spelling test. Then maybe you could tell her what your teacher said about it and how you feel. This encourages their confidence, focus and storytelling when talking. In my experience as a k-8 teacher, the biggest piece of advice I have for parents is to have your children advocate for themselves and express their needs early on. So often, as parents, we speak for our children, instead of encouraging them to do so. My oldest (who is kindergarten) and I, often practice this at home. So, for instance, if he comes home and tells me he lost his book and needs another one, instead of emailing the teacher myself, he and I practice how he can talk to his teacher. I model how to ask questions and we discuss examples of good times that he can ask. When he has trouble remembering (like most five-year-olds do! ), I facilitate this discussion in person. “Connor, did you want to ask Mrs. M. something?” Teaching kids this skill early on, allows them to develop the courage and know-how to use their own voice, so that they can be successful later on. A great way to increase good communication skills with children is to read books with them. Not only will they grasp language from the story itself but you can talk and ask questions whilst reading. Encourage them to ask and answer questions in return. Reading is a great tool for speech and as an added bonus gives you an activity to do together as a family. I would say talk to them, all the time, about everything. Ask their opinions and really listen to them, not with half an eye on your phone etc. Make eye contact and listen carefully, responding thoughtfully as appropriate. One big thing we do is to spend time chatting at the end of the day. We ask ‘What was the best part of your day?’ and then ‘What would you like to change?’ or ‘What would you have done differently?’ By really listening to the answer we make connections, learn from each other and encourage conversation. We have also never tuned down our vocabulary, so our 5 year old is very articulate and uses words way beyond her peers. We’ve always spoken to my son in ‘proper English’ rather than ‘baby speak’ and discuss a wide range of topics with him. It’s a great way to improve and increase his vocabulary. He has always been really interested in vehicles and from early on would pick factual books from the library. He’s learnt a great deal about tractors and diggers, farming and construction that way, and at the age of 5, has an encyclopedic knowledge! The one thing I try to make sure my children do, is to look people in the eye when they speak to them. It’s such an important way to show confidence and engagement, but children find it really difficult, so I remind them a lot. Whatever age your child is, say your sentence and then stop to give them time to reply, and actively listen to what they say. It doesn’t matter if they’re 4 weeks old, 4 years old or 14 years old. They have to know that what they say to you is given value, and was worth their effort. By listening to them you teach them to actively listen and they quickly learn the rules for conversation, and the benefits of being able to communicate. Becoming a regular pen pal with a far away loved one is exciting for any child and fantastic for developing their communication skills. My kids have corresponded with their Gran who lives a few hours away since they were toddlers. 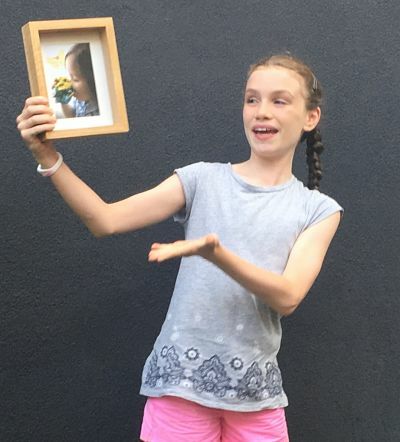 They started out sending her drawings about their day and now they write her newsy letters and enclose a poem, a story, a painting, a photo or a special school project. They are always sure to ask Gran about what she is up to and they like to find special things that they know she is interested in (for instance, my son recently sent her a photo of a Kombai tribe as he knows she is going on a cruise to Papua New Guinea very soon). In between snail mail letters, they send emails and Skype each other. Long live the pen/online pal! I am a teacher so would love to give a comment as I think that communication skills are really important and often undervalued. From a young age I have always been really keen to ensure that my children speak to their peers and adults politely. Often when they would ask for something they would just demand it for example “give me that toy”. Now my daughter is four when she is asking for something we always encourage her to “say it nicely”. So instead we would like her to say “Please could you pass me that toy Mummy” or if she is at a birthday party we always encourage her to go up to the host of the party and say “Thank you for having me”. When she does it of her own accord we always give her lots of praise! And now we have noticed her little brother of two has also picked up on it too! Starting from a young age, I encouraged my kids to be independent. Creating communication skills is one of the most important things we can teach our children. With my kids I started with small acts, for example, letting them pay at the register when buying something, or having them be the one to hand the ticket to the attendant at the movie theatre. Doing this taught them to be aware and has given them both the courage as teens now to speak up when they want or need something. I have always encouraged my children to handle any ‘issues’ they have at school by themselves. If they have lost something, I encourage them to go to the school office and ask to look in lost property and explain what they have lost and what it looks like. If they are confused about a piece of work, I explain to them ways they can approach their teacher and ask for help. Yes it would be much easier for me to step in, but I have seen them grow in confidence when they tackle – and find a solution – to problems themselves. Think of public speaking being a skill like football or netball. You can kick the footy or shoot some hoops in the back yard with your child, but your child will likely become even better if they also join a team and have a coach to fine tune their skills and gain match experience. They can also learn from their teachers and from others around them. Find a great speech & drama teacher & programme so your child can be coached and practice more regularly. With regular practice, guidance & training comes greater confidence, skill & ability. Then seek and create opportunities for your child to gain audience exposure. Start small and build over time. For example, something as simple as a short thank you speech at your child’s 5th birthday party (or at any age) is a great opportunity to show gratitude and gain experience speaking in front of a supportive audience of family and friends. Even if it’s just one or two short sentences after cutting the cake. If You Have Your Own Tips, Please Share In Comments. To Be Kept Informed Of Our Latest Articles, Like Us On Facebook.